A scene from Welcome to Marwen. Universal Pictures and DreamWorks Pictures. We are now inside the bar. G.I. Julie, Carlala, Suzette and Anna are at the bar. The dolls are alive. Never before has the fate of a movie relied so heavily on the execution of a simple four-word phrase. Welcome to Marwen is a Universal Pictures and DreamWorks Pictures feature starring Steve Carell that takes place in the real world, as well as a world populated by dolls. It was released by Universal on December 21. In the script, which is excerpted above, the transitions from the real world to the doll world are written simply as “THE DOLLS ARE ALIVE!” But making that happen on the big screen in a convincing way wasn’t quite as simple as that. It took the collective efforts of the editorial and visual effects teams over a year to bring the doll world of Marwen to life. 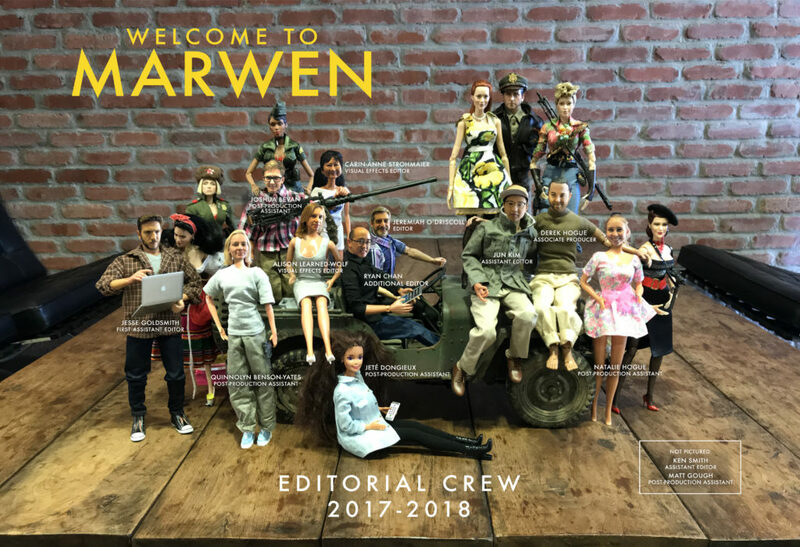 The motion capture/live-action hybrid process that we utilized on Welcome to Marwen was as challenging for the assistant editors as it was rewarding for the editors. Since I started the show as the first assistant editor and ended it as additional editor, I can give some insight into the making of Welcome to Marwen from both perspectives. 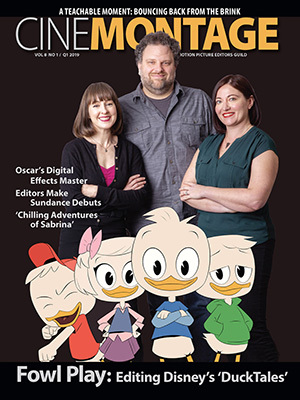 Four of the members of the editorial team on Welcome to Marwen have worked for director Robert Zemeckis for 15-years. Jeremiah O’Driscoll started as an apprentice under Arthur Schmidt, ACE, on 1992’s Death Becomes Her. Visual effects editor Carin-Anne Strohmaier started in the film industry as an assistant editor on 1988’s Who Framed Roger Rabbit. Alison Learned-Wolf, also visual effects editor, and I first worked with Zemeckis (or Bob, as he prefers to be called) as assistants on 2004’s The Polar Express. In addition, one of Bob’s longtime collaborators, producer Steve Starkey, got his start as an assistant editor on The Empire Strikes Back (1980) and Return of the Jedi (1983) And finally, one of Bob’s first jobs in the industry was as an assistant editor at IMAX. Having a director and a producer who understand what we do in post was invaluable to the process. 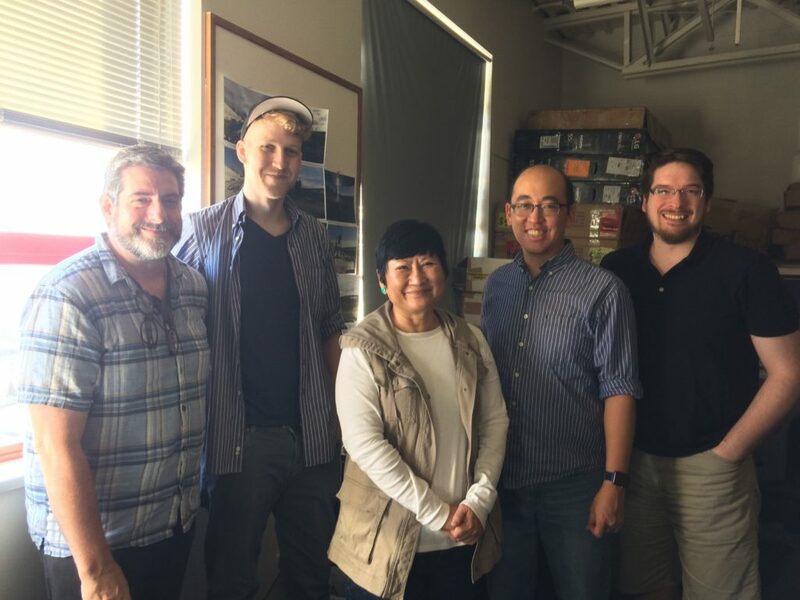 The Welcome to Marwen Vancouver crew, from left, Jeremiah O’Driscoll, Matt Gough, Carin-Anne Strohmaier, Ryan Chan and Ken Smith. Jeremiah, Carin-Anne and I headed up to Vancouver, British Columbia in fall 2017, where the live-action footage was shot on sound stages and on location in and around the city using ARRI Alexa 65 cameras. We were joined there by assistant editor Ken Smith and post-production assistant Matt Gough. Bob likes to shoot a lot of footage at 48fps to give editorial extra frames with which to work. Prepping that footage involved time-warping the action back to 24fps, sync’ing it to the production sound, and then grouping the multi-camera footage. Despite these extra steps, the dailies process was, for the most part, uneventful. Halfway through production, the live-action unit wrapped and the crew moved onto a motion capture stage at Vancouver’s Martini Film Studios. Before production, Bob and his team decided to shoot the doll characters using motion capture, which gives filmmakers the ability to capture actors’ movements and apply that motion to characters in the computer — in this case, the dolls in the lead character’s imagination. Bob previously directed or produced five MoCap features: The Polar Express, Monster House (2005), Beowulf (2007), A Christmas Carol (2009) and Mars Needs Moms (2011). In those films, the directors had the freedom to put their cameras wherever they wanted in post-production. Because the budget for Marwen was a fraction of that of any of those movies, the visual effects team, led by visual effects supervisor Kevin Baillie and visual effects producer Sandra Scott from Atomic Fiction (later purchased by Method Studios), had to find a more economical way of getting the actors’ performances onto the screen. 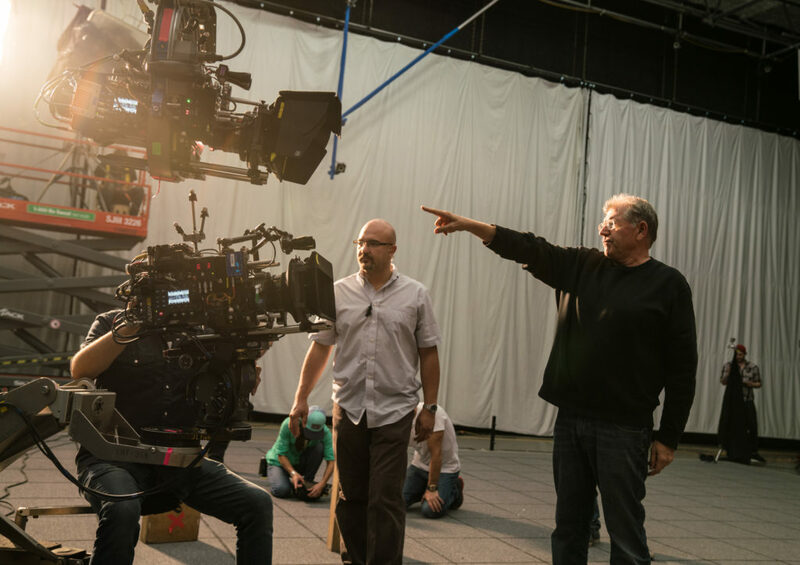 Director Robert Zemeckis, right, on the motion capture stage shooting Welcome to Marwen. 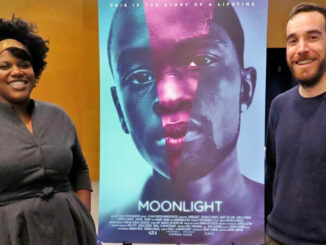 Photo by Ed Araquel/Universal Pictures and DreamWorks Pictures. Their solution was to shoot the MoCap scenes using the same ARRI Alexa 65 cameras that were used for the live-action scenes. When the cut was turned over, visual effects would then extract the actors’ eyes and mouths from the Alexa footage for each shot and graft them onto the doll characters’ faces. To make the eye and mouth elements match the look of the scenes they’d be pasted into, the MoCap sets needed to be lit and full make-up applied just as they would on a live-action set. In this new process, Bob had much less freedom to move the camera wherever he wanted in post; the shots used in the movie had to exactly match the angles that were shot on the MoCap set. In a given shot, any change that moved the camera off-axis would make the Alexa footage useless. As a result, the MoCap shoot and the digital layout shoots needed to be meticulously planned to avoid costly changes later on down the pipeline. We wrapped the MoCap shoot in early October 2017 and headed back to Bob’s offices near Montecito, California to “officially” start post-production. When we got back to California, our full team was reunited, including Alison. 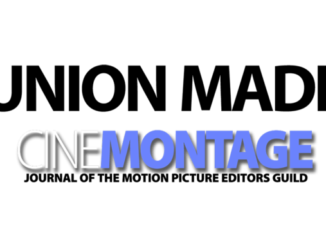 We were also joined by new team members Jesse Goldsmith (assistant editor) and Jeté Dongieux (post-production assistant). And as he has on the last few Zemeckis films, associate producer Derek Hogue was there to keep us on schedule and to put out any fires. One of the biggest items on the agenda was for Bob to create the shots he needed for the cut. The plan was to bring in a team of layout artists — virtual camera operators — to help him design shots in the computer and give him the ability to work out his camera moves with a virtual camera. On our previous MoCap movies, it took about a year of back-and-forth between layout and editorial to create all the shots needed for the cut. Marwen was simpler since more than half of the movie was live-action, but we still had to get all of our shots in eight days. 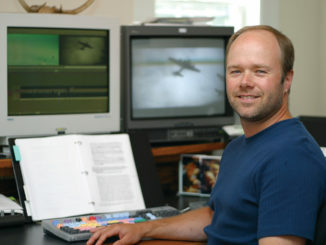 The director’s cut was spent with Bob bouncing between fine-cutting live-action scenes and cutting the MoCap footage to prep for the layout shoots. When we didn’t have existing footage to use as a placeholder (or a shot we could steal from another movie), we’d use our phones to shoot video of toy cars and foamcore models or the actual doll props from the set to fill gaps in the cut. To cut down on the amount of work the motion capture team had to process, editorial prepped “performance assembly” files based on the exact portion of each scene that needed to be shot. A performance assembly is an edited scene in the Avid that the MoCap team recreates with digital puppets in a 3D digital set. For the first layout shoot, editorial turned over 24 performance assemblies. That shoot, which took place before Thanksgiving 2017, went relatively smoothly. We spent four solid days shooting coverage with layout artists Matthew Ward and Keith Reicher. Kevin Baillie, Sandra Scott and visual effects production manager Francesca Mancini were there to supervise from the Visual Effects end, and Bob’s longtime script supervisor Luca Kouimelis kept track of it all. When the dust settled and the teams headed home, the layout team had created 173 shots over four days. In editorial, we felt like we had the shots and time we needed to cut that material to get through the next couple visual effects turnovers. In early December, a series of wildfires ignited across Southern California. The largest was the Thomas fire, which started near the city of Ventura. Fanned by Santa Ana winds, the fire grew to cover 140,000 acres over the next four days. As it approached Montecito and smoke started creeping into the office, we packed up our backup drives and headed south. We set up shop in the heart of Hollywood, a few blocks from the TCL Chinese and Dolby Theatres. 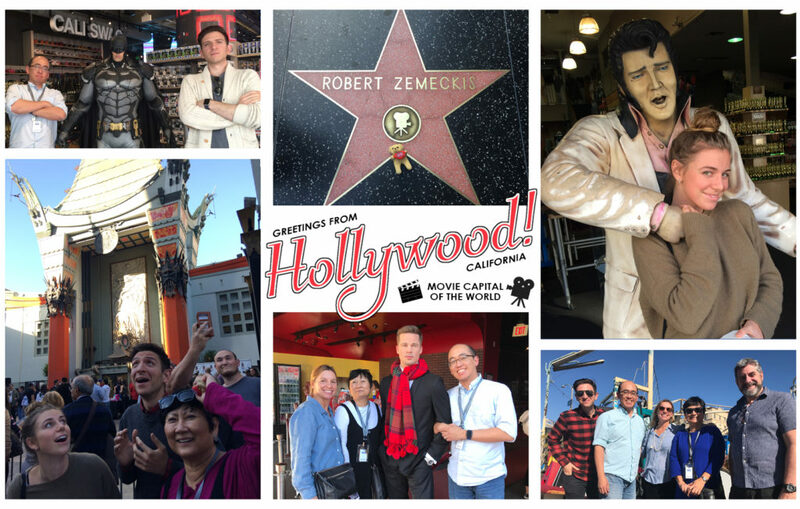 The editorial crew playing tourist in Hollywood: Clockwise, from top left, Ryan Chan, left, “Batman” and Jesse Goldsmith; “Elvis Presley” and Jeté Dongieux; Jesse Goldsmith, left, Ryan Chan, Alison Learned-Wolf, Carin-Anne Strohmaier and Jeremiah O’Driscoll; Alison Learned-Wolf, left, Carin-Anne Strohmaier, “Brad Pitt” and Ryan Chan; Jeté Dongieux, left, Jesse Goldsmith and Carin-Anne Strohmaier. We spent our days at the makeshift office cutting and turning over scenes to visual effects, while also keeping a close eye on Twitter and our newsfeeds to see if our office was going to survive. By the time the holiday break came around, the fires were under control and had moved away from Montecito. We could breathe easier as we headed to our respective homes for the holidays, knowing that our tiny beach town had been spared. When we returned to work in January, we had less than a week to prepare for the second and final layout shoot. We prepped 26 performance assemblies, confident that we were prepared for every scenario that could arise. The second layout shoot started off slowly. Technical issues on the first day bogged down the workstations and some files wouldn’t open. It didn’t help that rain clouds had moved in, which caused some power issues at the office. We finished the first day a little behind, but the team was optimistic we’d be able to make up some ground in the morning. Some of the team headed north to Santa Barbara for the night. Others went home to Los Angeles. Still others stayed at a hotel just up the road from our office. The rain poured throughout the night. On top of that, a reported half-inch of rain fell in a span of five minutes in an area that had been ravaged by the wildfires a month prior. Mud and boulders from the Santa Ynez Mountains flowed down into the city of Montecito, destroying homes and taking at least 20 lives. The National Guard (and our AP Derek) evacuated the crewmembers that were staying in the Montecito hotel, including Bob, who earlier in the day had been evacuated from his home. The next morning, with a section of the 101 freeway covered in mud and debris, half of the team was stuck north of the mudflows and had no way to get home or to the office. While the team took that day off to recover and check in with their families, Derek was working out the logistics of getting everyone back to the office to continue the layout shoot. Cars couldn’t get through and Amtrak’s route was cut off; the producers even considered chartering a helicopter to get us to the cutting room. After the devastating mudslides, the crew arrives in Ventura via ferry. Alison Learned-Wolf flashes the peace sign. 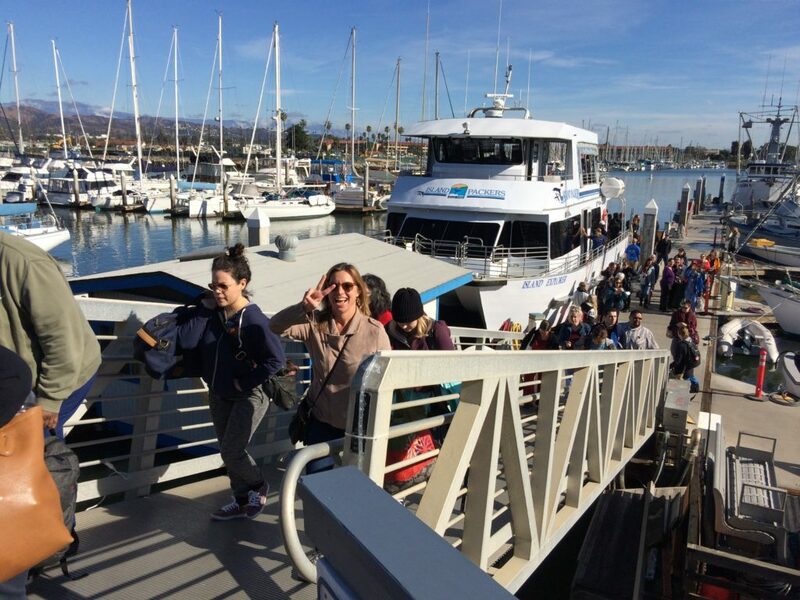 In the end, the crewmembers in Santa Barbara hopped on a ferry south to Ventura, where other crew members were waiting to drive them back to the office. A day and a half after the mudslides, the whole team was reunited and we were back in the office shooting. Somehow, despite the natural disaster that we had experienced, we ended up getting everything we needed. Bob and the team created 234 shots over four days, far surpassing the amount of coverage created during the first session. When the final layout shots were rendered and delivered, it was a race to sync the shots up with the corresponding MoCap footage, cut the layout shots into the movie, and then turn it all over to visual effects to start the long process of bringing the dolls to life. With the amount of work piling up and visual effects turnover deadlines fast approaching, I got bumped up to additional editor, Jesse got moved up to first assistant and another assistant, Jun Kim, was brought on. Keep in mind that the assistants were tasked with keeping track of live-action, motion capture, pre-vis, on-set layout, director’s layout, rough layout, temp animation, and post-vis footage, along with the usual visual effects deliverables — all on a movie with a the budget about the same as Clint Eastwood’s Jersey Boys. In addition to all of those tasks, Jesse’s main duty was to take notes with Bob and the editors. This was my role until the day I started editing with Bob, and it was Jeremiah’s role before me, when Bob was cutting with his longtime editor, Artie Schmidt. For me, getting to watch Bob and Jeremiah work on various projects over the last 15 years was like getting a master’s degree in film editing. Years of listening to them discuss shots, performances, music and sound came in handy when it was my turn to sit in the hot seat, and I’m extremely thankful to both for giving me the opportunity to cut on such a challenging film. Bob would start each day by watching scenes with Jeremiah or me and give detailed notes. He would then head to the other editor’s room to watch more scenes, then come back to the first editor to watch changes. This back-and-forth continued until the end of the day, or when there were no more changes to be made. While all of this was going on, Jesse (whenever he had a free moment) and Jun worked on creating complicated temp visual effects comps and doing sound work to go along with the new changes. A seemingly simple shot on two characters walking up to and entering a building might use a director’s layout (DLO) shot as its base with a MoCap head, and a rough layout (RLO) head pasted over it, a freeze-frame of the eyes from a live-action take pasted over one of the heads, the left arm of a character from a pre-vis shot, the sky from a Google Image search and chimney smoke from a stock effects package. Like on most Visual Effects films, all of the craziness funneled down to the visual effects editors, who had to sort through it all, forensically dissect layers upon layers of effects, and distill all that information down to something that the visual effects vendors could understand. Carin-Anne and Alison worked around the clock to keep up with the cut and turn over the near-constant barrage of change info to Atomic Fiction. As an editor, the best and worst part of the MoCap process is that so much can be changed in post. You have the same editing toolkit that a live-action editor would have, but the number of elements that can be manipulated expands exponentially because you have the ability to remove or add action or lines in the middle of existing shots to create brand new shots — or to land camera moves in the perfect place. I learned from Jeremiah that it’s okay to be bold and try cutting a scene multiple ways. The freedom we have in the Avid to show multiple versions of scenes reduces the pressure to “get it right” on the first try when we’re presented with so many options. Welcome to Marwen is not a typical Hollywood movie with a three-act structure, based on characters that everyone knows and loves. It’s a quirky movie with a visual style that no one has ever attempted before. The process that we used had to be invented for this movie and was still being tweaked into the final weeks of post. When you combine that with an endless selection of options with which the editors could cut, having a director at the helm with a clear vision was integral to getting the project across the finish line. Since the movie partially takes place in a world populated by dolls, the editorial crew created a team photo of themselves, with the real dolls from the set and dolls dressed to look like each member on the crew. UNION MADE: A Career Plan? Who, Me?